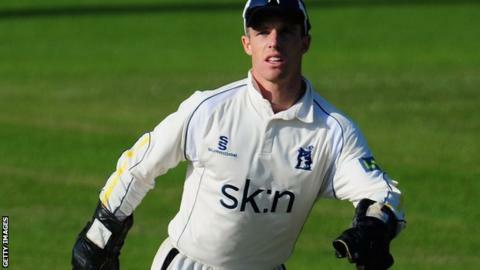 Former Warwickshire wicketkeeper Richard Johnson is "pleased" to have returned to Edgbaston in a new role. Johnson, 26, retired as a player midway through last summer with Derbyshire because of performance anxiety. But, having retrained at the Australian Institute of Sport, he has now taken on an Edgbaston backroom job as assistant strength and conditioning coach. "I am pleased to be back at Edgbaston but I didn't see it happening so quickly," said Johnson. "But county cricket is what I know so being back around so soon should help me. I am up to date with it all and know what is expected. Richard Johnson became the first player to win County Championship Division One and Division Two winners' medals in the same season in 2012 - with county champions Warwickshire and promoted Derbyshire. "At the time of retiring from county cricket I knew exactly what I had in mind for my next career. I had known for a while that fitness and strength and conditioning was what I wanted to do next. It had been a great passion of mine for many years. "One of the reasons for taking time out in Australia was to get plenty of experience before returning home and studying at university. I believe I will really be able to help, especially with the academy lads and younger professionals. It wasn't too long ago I was in their shoes. "It's a dream come true being back at the club I grew up playing for from the age of 11. It is an amazing opportunity for me and was an absolute no-brainer when I was on the phone to Dougie Brown."